An open-to-all 5-a-side football tournament will be played on the coming weekend, April, 11 and 12 at Kicks on Grass, Bellandur, off-Outer Ring Road. This 24-team tournament is organized by Love for the Game, a group of Bangalore-based working professionals with a lot of passion towards the beautiful game of football. With lots of awards and prizes at stake each team consists of 8 players, 5 on the field with 3 rolling subs. Teams are divided into 6 group of 4 teams. Group matches are played in league format, minimum of 3 matches guaranteed for each team. Group toppers qualify for Knockouts, wherein the 2 best toppers directly play semis whereas the other 4 fight it out for the other 2 spots in semis. 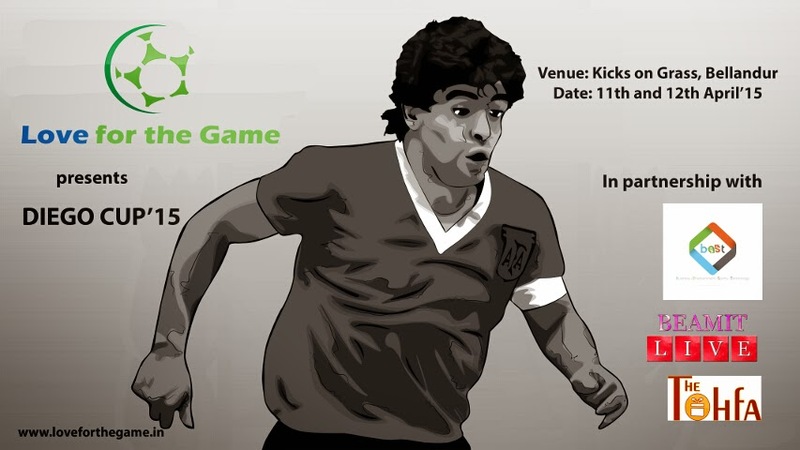 Diego Cup' 15 has garnered huge response with all the slots being filled up! The uniqueness of this amateur football tourney is the access and ability to stream Diego Cup' 15 live over the internet. Love for the Game is partnering with www.beamitlive.com for live streaming. Imagine the power and possibilities when you reach out to the millions over the internet!